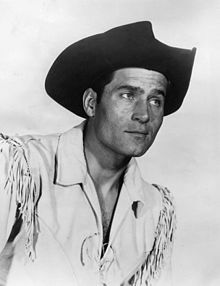 Clint Walker was born Norman Eugene Walker in Hartford, Illinois, on May 30, 1927; the son of Gladys Huldah (née Schwanda) and Paul Arnold Walker. His mother was Czech. He had a twin sister named Lucy (1927–2000). Walker left school to work at a factory and on a riverboat, then joined the United States Merchant Marine at the age of 17 in the last months of World War II. After leaving the Merchant Marine, he worked doing odd jobs in Brownwood, Texas, Long Beach, California, and Las Vegas, Nevada, where he worked as a doorman at the Sands Hotel. Walker was also employed as a sheet metal worker and a nightclub bouncer. Walker became a client of Henry Willson, who renamed him "Jett Norman" and cast him to appear in a Bowery Boys film (Jungle Gents) as a Tarzan-type character. In Los Angeles, he was hired by Cecil B. DeMille to appear in The Ten Commandments. A friend in the film industry helped get him a few bit parts that brought him to the attention of Warner Bros., which was developing a western style television series. 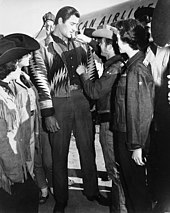 Walker's good looks and imposing physique (he stood 6 feet, 6 inches tall with a 48-inch chest and a 32-inch waist) helped him land an audition where he won the lead role in the TV series Cheyenne. Billed as "Clint Walker", he was cast as Cheyenne Bodie, a roaming cowboy hero in the post-American Civil War era. His casting was announced in June 1955. Cheyenne originally appeared as part of Warner Bros. Presents rotating with adaptations of Kings Row and Casablanca. Cheyenne turned out to be the breakout hit. While the series regularly capitalized on Walker's rugged frame with frequent bare-chested scenes, it was also well written and acted. It proved hugely popular for eight seasons. Walker's pleasant baritone singing voice was also occasionally utilized on the series and led Warner Brothers to produce an album of Walker doing traditional songs and ballads. Early in the series run, Warners announced they would star Walker in a feature, The Story of Sam Houston. It was not made. In April 1956 Walker said "I don't think I'd want any other roles ... Westerns keep me outdoors and active." Warners cast Walker in the lead of a Western feature film, Fort Dobbs (1958), directed by Gordon Douglas. Howard Thompson described the actor as "the biggest, finest-looking Western hero ever to sag a horse, with a pair of shoulders rivaling King Kong's". A number of Cheyenne episodes were cut into feature films and released theatrically in some markets and Walker guest starred as Bodie in an episode of Maverick. (He also guest starred on an episode of 77 Sunset Strip.) Warners tried Walker in a third Western feature directed by Douglas, Gold of the Seven Saints (1961), this time co-starring Roger Moore, who was also under contract to Warners. Walker had a role in Kraft Suspense Theatre (episode "Portrait of an Unknown Man", alongside Robert Duvall). He had a supporting role in the Rock Hudson-Doris Day comedy, Send Me No Flowers (1964). Frank Sinatra cast him in the leading role in the war drama None but the Brave (1965), the only film Sinatra directed. After doing some guest appearances in The Lucy Show he fought a grizzly bear in Paramount's Western, The Night of the Grizzly (1966). He starred in a family adventure movie shot in India, Maya (1966). Walker had his biggest hit to date when he played the meek convict Samson Posey in the war drama The Dirty Dozen (1967). Walker returned to Westerns with More Dead Than Alive (1969). The New York Times described the actor as "a big, fine-looking chap and about as live-looking as any man could be. And there is something winning about his taciturn earnestness as an actor, although real emotion seldom breaks through". Walker was one of many names in The Phynx (1970) and returned to TV with the leads in some TV movies, Yuma (1971), Hardcase (1972), and The Bounty Man (1972). Walker supported Telly Savalas in the biopic Pancho Villa (1972) and starred a short-lived series in 1974 called Kodiak, playing an Alaskan patrolman. He starred in the made-for-television cult film Killdozer! the same year as well as Scream of the Wolf (1974). Walker starred in Baker's Hawk (1976) and had support parts in Snowbeast (1977), and The White Buffalo (1977). He starred in the Canadian Deadly Harvest (1977) and had a small role in Centennial and Mysterious Island of Beautiful Women (1979). Walker met western author Kirby Jonas through James Drury, a mutual friend. Jonas and Walker subsequently spent two years collaborating on a storyline by Walker involving gold and the Yaqui. The partnership led to the publication of the 2003 Western novel Yaqui Gold (ISBN 978-1-891423-08-6). Walker has a star on the Hollywood Walk of Fame at 1505 Vine Street, near its intersection with Sunset Boulevard (approximate coordinates: 34°05′53″N 118°19′36″W﻿ / ﻿34.098084°N 118.326643°W﻿ / 34.098084; -118.326643). Walker had three marriages, each of which lasted approximately twenty years. Walker married Verna Garver in 1948. The marriage produced one daughter, Valerie (born 1950) before ending in divorce in 1968. Valerie became one of the first female airline pilots. In 1974, Walker married Giselle Hennessy, who died in 1994. Walker then married Susan Cavallari in 1997. Eventually he took up residence in Grass Valley, California. In May 1971, Walker narrowly escaped death in a skiing accident at Mammoth Mountain, California. In a fall from a ski lift, Walker was pierced through the heart with a ski pole. He was taken to a hospital and pronounced dead. However, a doctor detected faint signs of life and rushed Walker to surgery, where his damaged heart was repaired. Within two months, Walker was working again. Walker died of congestive heart failure in Grass Valley, California, on May 21, 2018, nine days before his 91st birthday. 1993: Tropical Heat (TV) — episode "The Last of the Magnificent"
1995: Kung Fu: The Legend Continues (TV) as Cheyenne Bodie, episode "Gunfighters"
^ At age 73, Walker's twin sister, Neoma L. "Lucy" Westbrook, died on November 11, 2000 at her residence in Hartford, Illinois. ^ Pryor, Thomas M. (July 10, 1955). "Hollywood Notes". The New York Times. ^ "Media Room — National Cowboy & Western Heritage Museum". ^ Pryor, Thomas M. (November 15, 1955). "Jennifer Gets Lead in Hemingway Novel". The Cincinnati Enquirer. p. 14. ^ "Western and 'Lafayette Escadrille' Open", The New York Times, April 19, 1958. ^ "Great Western Performers". National Cowboy & Western Heritage Museum. Retrieved May 22, 2018. ^ "Chicago Tribune — Historical Newspapers". ^ "Valerie Cottle (WG #175) in the cockpit for Western Airlines :: Whirly-Girls". twudigital.contentdm.oclc.org. ^ Schwartz, John (May 22, 2018). "Clint Walker, Western Star Tall in the Saddle, Is Dead at 90". The New York Times. Wikimedia Commons has media related to Clint Walker.